Harborview Grande 701 enjoys the large floor plan of all the Harborview Grande condos. Immediately upon entering the door you will receive a sense of the square footage this vacation rental has to offer. The full kitchen has marble countertops, new refigerator, stainless steel double sink, and a collection of convenient, time saving countertop appliances. The large great room includes a spacious dining room area and a full living room furniture set, including a large flat screen TV. The living room ends at a floor to ceiling glass wall with sliding glass doors. 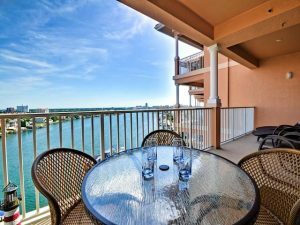 Beyond is the patio and a stunning view of Clearwater Harbor with the city of Clearwater on the other side. To the north is a breathtaking view of the heart of Clearwater Beach and peak-a-boo vistas of the Gulf of Mexico. The master bedroom is large, and enjoys its own harbor views with a floor to ceiling glass wall and sliding glass doors onto the balcony. The en suite master bathroom is connected to the bedroom by walking past the walk in closet. The master bathroom includes a separate lavatory room, two sink vanity, large tub, and separate stand up shower. The unit is a three bedroom, with the two guest bedrooms at the front. They both have plenty of floor space and can sleep two people each on their queen size beds. A separate hall bathroom sits just outside the doors of the two bedrooms. The in-unit washer and dryer is in a closet near the hall bathroom. WiFi is available in the unit from the living room electronics.